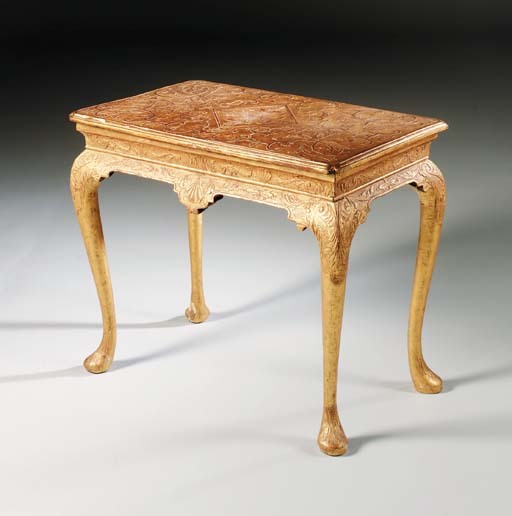 The table-frame relates to the silvered gesso table bearing the arms of Meller which was supplied to Erddig, Denbighshire, formerly attributed to James Moore (d. 1726), and now attributed to John Belchier (R. Edwards and M. Joudain, Georgian Cabinet-Makers, London, 1955, rev. ed. p. 136, fig. 31). The same shell-enriched frieze features on a closely related table sold anonymously, Sotheby's New York, 13 October 1994, lot 184.